I've mentioned the 1844 pamphlet published in Liverpool that includes Letter VII. The Millennial Star began publication in May 1840. The second issue, June 1840, contained excerpts from Oliver's letters. The first letter was published in full in January 1843, accompanied with a promise to publish all of them in a pamphlet. Oliver was not a member of the Church when these reprints were published, but he had been Assistant President of the Church when he wrote the letters and members considered them important and authoritative (unlike Phelps' answers, which were never approved by Joseph Smith or reprinted). This publication history shows that Oliver's letters were reprinted continuously from 1840 through 1847 with Joseph's express permission and encouragement, as well as his implicit approval. People have asked about it so here is the background information provided by Peter Crawley, who has done a phenomenal job with his Descriptive Bibliography. 48 pp. 17.5 cm. Yellow printed wrappers. Oliver Cowdery’s eight letters to W. W. Phelps, first published in the Messenger and Advocate between October 1834 and October 1835, constitute the earliest printed account of the birth of Mormonism. Extracts from the letters were included in the Millennial Star for June and September–November 1840, and the letters were reprinted more or less in full in the Times and Seasons of November 1–December 15, 1840, and March 15–May 1, 1841. They were again republished in the sixth number of the Gospel Reflector (item 95). A comparison of the various printings makes it clear that the pamphlet Letters by Oliver Cowdery was taken from the Gospel Reflector. Thomas Ward included the first letter in the Millennial Star of January 1843 and announced there that he intended to publish all eight in pamphlet form. One year later the Star noted that Letters by Oliver Cowdery was in press, and in February 1844 it advertised the pamphlet as just published, price 6d. each, or 5s. per dozen. The Star advertised it again in November 1846, now at 3d. And the European Mission financial records show that during 1847 the Millennial Star office sold about nine hundred copies at a wholesale price of 2d. each. It is the second work co-published by John Cairns (see item 102). The verso of the title page bears the imprint Liverpool: Printed by James and Woodburn, Hanover-Street, while the colophon at the foot of p. 48 reads Liverpool: Printed by James and Woodburn, South Castle Street. It was issued in yellow wrappers, the title page, with an added line “Truth will prevail” following Latter-day Saints, reprinted within an ornamental border on the front, and book advertisements on the back. Cowdery’s first letter describes his initial contact with Joseph Smith, his participation in translating the Book of Mormon, and the appearance of John the Baptist which he and Joseph Smith shared. In the third letter he moves back in time and discusses the revival led by Rev. Lane in the Palmyra area, the attendant religious excitement, and the Smith family’s religious seeking—events that are usually associated with Joseph Smith’s 1820 vision. At this point a curious textual change occurs. The version of this letter in the Messenger and Advocate states that this religious excitement occurred during Joseph Smith’s fifteenth year. In the pamphlet 15th is changed to 17th. The fourth letter picks up the narrative and, in the original version, it states that the reference to the fifteenth year in Letter III was “an error in the type—it should have been in the 17th. . . .This would bring the date down to the year 1823.” The pamphlet version eliminates any reference to an error and, like the original, proceeds from this point with an account of the appearance of the angel to Joseph Smith on September 21, 1823, an event that is entirely unrelated to the religious excitement described in the third letter. These changes follow the Gospel Reflector, so Benjamin Winchester must have been responsible for them. Whatever was intended in Letter III, certain problems persist. Joseph Smith’s seventeenth year was 1822, not 1823. And Rev. George Lane was most prominently in the Palmyra area in 1824–25. It is conceivable that Cowdery shifted the date after realizing he had introduced Lane at the wrong time. It is also possible that he described the events leading up to Joseph Smith’s 1820 vision in Letter III with the intent of recounting it in Letter IV; then, after Letter III was printed, he decided not to mention the vision, which at the time was not openly discussed (see item 82). Letter VII continues the account of the angelic visitation on September 21, 1823, and of the events just following. It includes a description of the Hill Cumorah, where Joseph Smith obtained the plates. 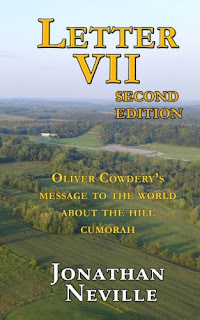 Letter VIII further describes Cumorah and relates the vision he had at this spot. The next-to-last paragraph refers to a trial he was subjected to sometime between 1823 and 1827—undoubtedly the trial at South Bainbridge, New York, in 1826. The pamphlet concludes with a short letter from Joseph Smith, first published in the Messenger and Advocate of December 1834, in which he comments on his early life. Flake 2546. CSmH, CtY, CU-B, DLC, ICHi, MoInRC, UHi, UPB, US1C, UU.